The video shows the tide rising, causing the eggs to float within the nest cup. The female then returns about 7 minutes after the flood has receded from her nest, and you can see her incubating at the end of the video. 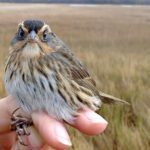 Apgar’s observations support previous research done by a UConn graduate student, Carina Gjerdrum, who used temperature loggers to monitor Saltmarsh Sparrow nests. Using the temperatures collected at the nest, she determined that female Saltmarsh Sparrows would return to incubate eggs that experienced several flooding events. Samantha is using funding from the Garden Club of America to collect these recordings of flooding events at the nest because she’s interested in the behaviors of chicks and adults during the highest tides when most nests are flooded. 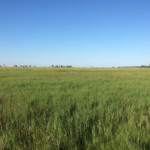 Nest flooding will increase with sea-level rise, and the behaviors of tidal marsh birds may indicate their capacity to persist during extreme and increasing flooding events. This entry was posted in Graduate Student, SHARP Blog, Student Award. Bookmark the permalink. Marsh Habitat Zone Map released!